Technology companies are lowering their revenue guidance for the first quarter at a rate not seen since the fourth quarter of 2012. The moves come against a generally dismal backdrop for corporate profits, with the S&P 500 expected to show a year-over-year drop of 3.7 percent. Despite the dour outlook, stocks have held up well, with the Nasdaq tech barometer up more than 16 percent. Investors haven't seemed to care about the declining outlook. On simple earnings per share, information technology has been by far the greatest number of downgrades, with 26 companies lowering expectations against just 13 raising. 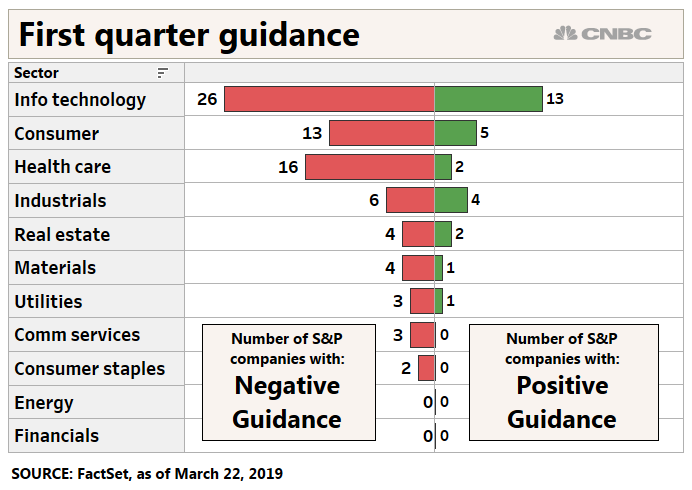 The 26 percent of total companies in the sector issuing negative guidance is well ahead of the five-year average of 20.2 percent, according to FactSet records. It's also the highest level of companies issuing downgrades since the first quarter of 2016.